Protectant fungicides for managing powdery mildew in cucurbits: how do they stack up? Protectant (contact) fungicides are an important component of the fungicide program recommended for managing powdery mildew in cucurbits. They play a critical role in delayingdevelopment of resistance to systemic fungicides. 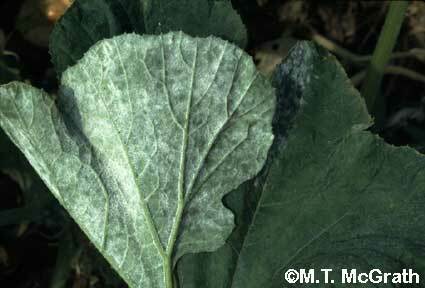 The fungus causing cucurbit powdery mildew has an established track record worldwide of being able to develop resistance to systemic fungicides. Most systemic fungicides are at risk for resistance development because they have single-site mode of action. Thus modification of one gene in the pathogen may be enough to enable the pathogen to resist the action of the fungicide. Most protectant fungicides are not at risk for resistance development because they have multi-site mode of action. Their role in resistance management is to control both sensitive and resistant strains thereby reducing the overall size of the pathogen population subjected to the resistance-selecting action of the systemic fungicides. Systemic fungicides are essential for managing powdery mildew on the underside of leaves (Figure 1) to avoid premature death of leaves (Figure 2). Therefore, managing resistance to prolong the utility of systemic fungicides is very important. It is important to recognize that the goal of resistance management is to delay development of resistance rather than to manage resistant strains; therefore, resistance management should always be a component of powdery mildew management. For more information, see the on-line articles on resistance. The integrated program currently recommended for managing powdery mildew includes nonchemical control measures plus a fungicide program with both systemic and protectant fungicides. Nonchemical control measures include selecting resistant varieties and separating successive plantings. These are important for managing fungicide resistance because they reduce the overall size of the pathogen population and because fewer applications of systemic fungicides may be needed for control, thereby reducing selection pressure for resistance. Further reduction can be achieved by using systemic fungicides only when needed and not curatively; this can be accomplished by scouting to ensure applications are started very early in powdery mildew development. Additionally, protectant fungicides alone may be sufficient for the last applications late in the growing season. The fungicide program should consist of an alternation among systemic fungicides with different modes of action (eg a QoI, aka strobilurin, fungicide, Quadris or Flint, alternated with the DMI fungicide Nova) and mixing these with protectant fungicides. When new systemic fungicides are registered, they should be added to the program or used in place of other systemics whose efficacy has been reduced due to resistance. Figure 1. Because powdery mildew colonies typically are larger with denser sporulation on lower leaf surfaces than on upper surfaces, control on lower surfaces (left section of this leaf which is folded over) is very important. Figure 2. Leaves on pumpkin plants sprayed weekly with the protectant fungicide chlorothalonil provided excellent control of powdery mildew only on upper leaf surfaces. Leaf is partially folded over to show that the lower surface is completely covered with powdery mildew, in contrast with the upper surface. 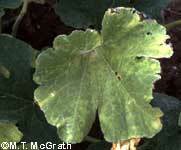 Leaf is senescing prematurely due to severity of powdery mildew infection on the lower surface. Several protectant fungicides are now registered for use on cucurbits to manage powdery mildew in the United States (Table 1). Chlorothalonil has been the primary protectant fungicide used for powdery mildew. Copper fungicides and sulfur have also been used. Several new products have recently been registered by EPA; others are being developed. Most of these new products have active ingredients considered to be biocompatible; several of these have been approved by OMRI for organic production. The active ingredients include mineral oil (products include JMS Stylet-oil, SunSpray Ultra-Fine, and Spray oil), potassium bicarbonate (Armicarb and Kaligreen), and monopotassium phosphate (Nutrol). Serenade is a biofungicide containing the bacterium Bacillus subtilis. Milsana, which contains extract of giant knotweed, has not been registered yet. Additionally, fertilizers such as Prudent Plus are being developed that promote protection from disease by stimulating the natural defense systems present in plants. There are formulations of JMS Stylet-oil, Kaligreen, and Serenade approved for organic production. These products provide an alternative to organic growers who prefer not to use copper or sulfur because they are elements and thus do not degrade. Efficacy is another important consideration, in addition to toxicity, when selecting a fungicide. The more efficacious the product, the greater its contribution to resistance management. Several protectant fungicides have been compared in field experiments conducted in Riverhead, New York (Table 2). Quadris applied in alternation with Nova plus Bravo was used as a grower standard in these experiments. It is the last treatment listed in Table 2. It is important to look at performance of fungicides used alone to assess their contribution within an integrated program. Products that were significantly less effective than Bravo when evaluated alone were equally effective when used with Quadris and Nova. Sulfur formulated as Microthiol Disperss, mineral oil formulated as JMS Stylet-oil, and chlorothalonil formulated as Bravo Ultrex were the most effective protectant fungicides, providing 93-98% control on upper leaf surfaces in 2001 (Table 2). Although these aren’t systemic, they did provide 37-55% control on lower (under) surfaces of leaves, which was at least partly due to reducing inoculum by controlling mildew well on the upper surface; better control was achieved with systemic fungicides. Sulfur can be phytotoxic on melons. The next most effective material was copper hydroxide formulated as Kocide 2000, providing 84% and 18.5% control, respectively. The biofungicide Serenade (Figure 3) and the health-promoting fertilizer Prudent Plus were less effective, providing 36% and 40% control, respectively, on upper leaf surfaces. Figure 3. Pumpkins in the foreground were treated weekly with Serenade while those in the background were treated on the same schedule with JMS Stylet-oil in 2002. Treatments with high powdery mildew severity had more defoliation late in the growing season and lower yield than treatments that provided better control of powdery mildew. For example, Serenade was the only treatment in 2001 that did not have less defoliation than nontreated plants on 6 September while the amount of defoliation with the more effective products, JMS Stylet-oil, Microthiol Disperss, and Bravo, was not significantly different from the standard program with Quadris and Nova. Pumpkins treated with Microthiol Disperss or the grower standard program of Quadris alt. Bravo plus Nova had the most fruit with good solid handles, an important measure of quality in Halloween pumpkins. These treatments were significantly better than the other treatments tested in 2001. Protectant fungicides that are less effective than Bravo when applied to a susceptible variety can be more useful for suppressing powdery mildew on resistant varieties. Typically resistant varieties do not provide complete control of powdery mildew and an integrated program including a few timely fungicide applications is recommended to improve control and thwart selection of new races of the pathogen able to overcome the resistant variety. A ‘biocompatible’ fungicide program (consisting of Kocide and Kaligreen applied in alternation on a weekly schedule beginning after mildew detection) provided 82%, 98% and 99% control on upper leaf surfaces of susceptible melon variety Superstar, variety Eclipse with race 1 resistance, and variety Apollo with resistance to races 1 and 2, respectively. This program provided 19%, 47%, and 86% on lower leaf surfaces, respectively. The various protectant fungicides differ considerably in price and in their range of activity (Table 1). Microthiol Disperss is the least expensive product tested. Armicarb and Serenade are the most expensive. Bravo and Kocide have the broadest spectrum of activity (Table 1). For more information on powdery mildew and its management, see the other on-line articles and the fact sheet on powdery mildew. Table 1. 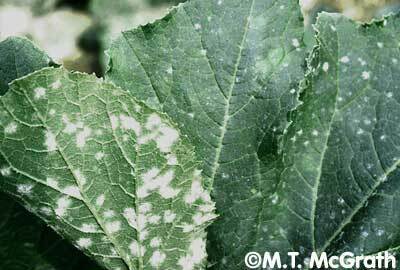 Several fungicides and health-promoting fertilizers for powdery mildew, their registration status on cucurbits in the USA including whether approved for organic production, cost, and other labeled diseases. y There are other products with the active ingredients chlorothalonil, copper, sulfur, and oil. Other copper fungicides are OMRI-approved for organic production. Table 2. 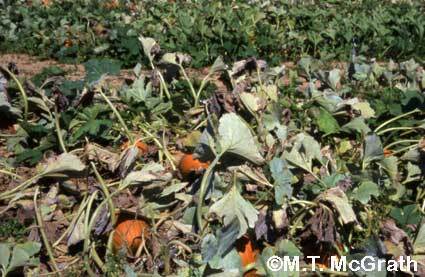 Percent control of powdery mildew achieved on upper and lower surfaces of pumpkin leaves with fungicides and health-promoting fertilizers applied weekly in experiments conducted in Riverhead, NY, in 1997 to 2001. Numbers in a column with a letter in common are not significantly different according to statistical analysis using Fisher's Protected LSD. Numbers with an 'a' are not significantly different from nontreated, thus control is 0%. Dash indicates fungicide not tested that year.